Delicious raw in smoothies or salad dressings, or as the savory orange spice behind the splendor of curry dishes, Turmeric is proving again and again to be one of the most beneficial and versatile natural health supplements one can take, and, it is surprisingly easily to grow. Turmeric, also known as Curcurma Longa, is related to the well-known ginger plant and also produces a rhizome that grows just beneath the ground. It’s tall and brightly colored tropical green leaves are beautiful in the garden and commonly used in landscaping, but the rhizomes are harvested as food and medicine, or re-planted seasonally. To grow this beneficial plant this, one only needs a few rhizomes, a pot and a sunny place. Just place a small section of the rhizome an inch or two under the soil and water regularly. They prefer tropical climates and plenty of rain, but are known to grow exponentially in a single season of 4-6 months with lots of water and sun. This is a remarkably easy to grow herb for everyday consumption and for preparedness gardens. Turmeric is delicious in many recipes, and ideas for using it in the kitchen are easy to find. In addition to eating it in it’s raw form, it’s commonly dried and ground into a powder or used in many delicious variations of curry spices. High quality organic turmeric powder is available for cooking and crafting medicines, and turmeric supplements in the form of capsules can also readily be found. Additionally, there are also many forms of tinctures, and extracts, that can be used to various beneficial ends. 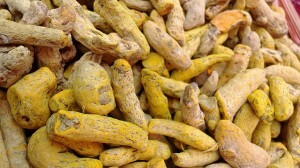 Bio-dynamic, organic Turmeric is also used in the production of high quality multi-vitamins. Turmeric can help to prevent and heal some forms of cancer. Turmeric can be of significant benefit in the treatment and prevention of Diabetes. Turmeric is a detoxifying food and can help the body remove from poisons, heavy metals and illness. Turmeric extract is an effective alternative to some anti-depressants. Turmeric can protect and regenerate the liver. Turmeric can relieve arthritis pain, and stop inflammation. Turmeric supports a healthy brain and heart. Turmeric boosts the immune system and can replace certain vaccines. Turmeric can help in weight loss. Turmeric can elevate the spirit.